First things first, I recently posted about my love for tea and as much as I hate that the internet monitors my searches, it sure does benefit me from time to time. Pinterest recommended a monthly tea subscription service and I got my first delivery a few weeks ago. I was able to tell them about my aversion to cloves and got a very kind “Welcome!” email from the CEO and the Facebook group community. My first style was an Orange Blossom Black Tea and it is so fragrant and delish! They also have a shop with lots of other varieties (all hand blended without any unwanted, mass market additions) and tons of covet-worthy accessories. I’m in love and already spreading the recommendation far and wide, hither and yon. Very much looking forward to my next delivery in a week or so. I was going to put this at the end, but it’s important to talk about what you love. 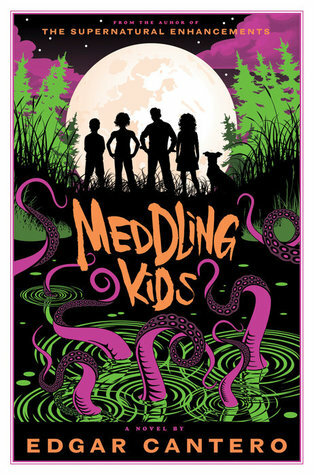 I recently finished Edgar Cantero’s novel Meddling Kids and, overall, I very much enjoyed it. But it made me think: why must there always be a love interest? Why?!? From the moment I found out that this novel existed, I was excited to read it. It ticked several of my boxes, being inspired by my childhood obsession (Scooby-Doo and the Gang) and containing elements of the supernatural and true crime. I want to say I first hear about it on a list of books that “will legit scare you;” it did not scare me even remotely, but it was a good mystery/thriller, nonetheless. 1990. The teen detectives once known as the Blyton Summer Detective Club (of Blyton Hills, a small mining town in the Zoinx River Valley in Oregon) are all grown up and haven’t seen each other since their fateful, final case in 1977. Andy, the tomboy, is twenty-five and on the run, wanted in at least two states. Kerri, one-time kid genius and budding biologist, is bartending in New York, working on a serious drinking problem. At least she’s got Tim, an excitable Weimaraner descended from the original canine member of the team. Nate, the horror nerd, has spent the last thirteen years in and out of mental health institutions, and currently resides in an asylum in Arhkam, Massachusetts. The only friend he still sees is Peter, the handsome jock turned movie star. The problem is, Peter’s been dead for years. For a while, I was worried that it might risk irritating me, since I was far from casual about my love for Scooby-Doo. Call it what it is: obsession. Sometimes, if things based on beloved originals take too many liberties, it risks offending the sensitive feelings of the fans, especially if formerly innocent teen characters are portrayed as drug-addicted, alcoholic, suicidal, mentally unstable twenty-somethings. However, I went into it knowing it was one person’s interpretation, so if it didn’t parallel my interpretation, or at least entertain me, I could always opt-out. At times, the supernatural elements got a little eye-roll-inducing. However, it was at least consistent. It didn’t pepper it in there for occasional flavor; it established a supernatural element pretty early and maintained the “wtf is happening”-ness, but it at least had the decency to have the characters acknowledge the oddness of it all. Cantero meshed some characters, so that both of the girls had Daphne elements and both had Velma elements. Fred’s character (they have different names) was dead but still an active participant (hello, supernatural), and Shaggy’s was decidedly un-Shaggy-like throughout. He made the characters his own while still leaving “Easter eggs” of relevance for the die-hard Scooby fans. I’m also a big fan of a mystery that surprises me; I get a little bummed when I figure out the big reveal before-hand. I didn’t see this one coming and it was a nice surprise. So that just leaves the ill-fitting love story. Why did that have to exist? In no way is it a spoiler for me to reveal that there was something of a lesbian interest constantly bubbling on a back-burner. That was made evident within the first few pages. However, this was one of those rare, end-of-the-world scenarios that was somehow overshadowed by inconsequential arguments and confusing emotions. These “kids” would find out that supernatural beings exist, and they’d put a pin in that in order to get to the more pressing matter of someone unexpectedly saying the l-word. And what’s with the unrealistic depiction of a girl who is loved by and lusted for by every single other character?!? Please. Enough. I have little patience for jamming a puzzle piece where it doesn’t fit in order to appeal to more readers, and this just felt like pandering. It’s as though Cantero wrote a perfectly love-free novel and his publishers went back and said, “okay, but this won’t appeal to people who like love stories, so we need to force that in somehow.” No, you don’t. Some books appeal to some people but very few (a.k.a. none) appeal to all, so why taint those that truly appeal to one audience by diluting them with essence-of-other-people’s-interests? The love story was uncomfortable and inorganic, and after suffering through it for 300 pages, it wasn’t even resolved in a way that offered a satisfying ending. They have a VERY rocky road ahead of them. I won’t even go into my thoughts on a thirty-something male writing the perspective of a teen lesbian. I’m going to let that sleeping dog lie. Anyway, I gave it four stars, since the overall experience was a pleasant one. Worse comes to worst, I can always skim sections that are dripping with unnecessary sappiness. Am I alone in this? Let’s don’t get political. I know, I used the term “expatriate” in my title and, believe me, it’s sounding pretty good right now, but the fact that America is a mess right now is all too known to we, the people. So, instead, let’s talk about how obsessed Americans are with coffee and how I ally myself with the tea-minded masses. Anyone who is not from the U.S. may find it hard to believe that very few Americans drink tea. I mean, I’m sure there are plenty of tea-drinkers somewhere out there, but as with the metric system, America wanted to do its own thing and set out to be purposefully difficult… I mean different. I, personally, don’t remember the last time I had coffee. I always found the smell to be utterly enticing, but the flavor has never appealed to me. So, when I was introduced to black tea some years ago, it was an epiphany that shifted into a complete lifestyle change. I will go ahead and tell you that it is not easy to be a tea-drinker in the U.S., or at least in the South. As mentioned earlier and according to some very brief and only mildly emotionally invested research that I just did, over $40 billion is spent on coffee annually in the U.S. Americans lurv that java juice. I’m reminded of that scene in the world’s best movie, “You’ve Got Mail,” when Tom Hanks’ character is musing about how the act of ordering coffee makes people feel like they’re in charge of something. “Tall. Decaf. Capp-u-cci-no.” As Joe Fox so wisely stated, people like to take charge by making all the tiny decisions that lead to their perfect concoction. The same can be said about tea, though, so I apologize for the digression. Anyway, the U.S. has almost collectively decided that we will drink coffee, so those of us who drink tea are metaphorically left out in the rain on many occasions. For instance, when I went to Ohio for Christmas this year, we went to IHOP (I know, I know) and, since this isn’t my first rodeo, I brought tea bags from home and had a few stuffed in my purse in case they didn’t have my preferred type. Well, when I asked if they had hot tea, she said, “yes I can bring you some Lipton” and I just asked her to bring me hot water. Of course, the water wasn’t the proper temp, but I just chose to pick my battles. Such is the eternal plight of the tea-drinking American who travels within the continental U.S. I recently lead a field trip to South Carolina and, again, sacrificed needed suitcase space so I wouldn’t find myself tea-less all weekend. I must give a shout out, though, to Marriott Hotels for including English Breakfast bags with the coffee pods in each room. I was so pleased to be proven wrong. I’m almost certainly over-extending my right to assume things, but I’m going to take the liberty of assuming that most, if not all, tea-drinking nations treat afternoon tea like a regular, everyday occasion that isn’t ridiculous even in the slightest. I feel like it reveals something about how American society perceives “tea parties” that part of the experience is that all members roam the establishment in order to find absurd accessories with which they adorn themselves while they sip tea with their pinkies as “out” as is physically possible. In fact, in the above pic, the owner came to take a picture of our table and insisted that we all “pinky out.” Check dem pinks for proof. I’m not complaining since, as you can see, I’ve been tearing up the tea party game since birth. In the days of yore, though, we’d put on our Sunday best and survey a multitude of bougie accessory options, like faux furs, parasols, lace gloves, obscene costume jewelry, and all the many many hats. This is how Americans think foreigners live daily life. The local shop closed within the past few years; it’s, honest to god, a miracle that it even existed so close to our little Podunk town. When it closed, I remember being so regretful that I didn’t know sooner so I could try to buy out all the absurd accessories. Maybe I should task my mother with finding the owner, still. As far as tea goes, I’m in it to win it for life, so my nephew and my future child will have to suffer through some tea parties, whether they like it or not. Shout out to Hannah and my sister for being my forever tea companions. Today, I continue the obsession with less accessorizing. I have loose leaf tea at work every day and I remain surprised every time a kid is unaware that tea is a thing. On weekends, I make a whole pot and sit it on my candle warmer so I can slowly sip it and enjoy a calm, casual morning. It has even permeated my birthdays and Christmases, since I get nice teas and useful tools regularly. Hannah gets me a box of Harrods English Breakfast every time she goes international, for which I am eternally and energetically thankful. Additionally, my mother recently organized all our family sets of china and brought me a cup and saucer from each of our sets. I also got some glass hobnail sets from my family museum, so I’m accumulating quite the collection of assorted sets. I know this is a book blog, so here is how I validate ranting about tea: IT’S MY BLOG! If you are upset, go do literally any other thing besides judge MY blog. Also, tea and books are like pb&j, so there. Come have tea with me! !